iPhone XR: Worth getting if the XS or XS Max is out of your budget? SINGAPORE: So you're coveting one of Apple's increasingly expensive iPhones - but are loath to stump up the cash for an XS or XS Max. Could the iPhone XR - Apple's slightly less pricey model - be a viable option when it launches on Friday (Oct 26)? We take a look at the three smartphones to see what features you will - and won't - get if you go for the XR. The iPhone XS, iPhone XS Max and iPhone XR have lots in common, from the same processor to the same notch. The iPhone XS Max is the largest and heaviest of the three phones, weighing 208g and measuring 157.5 by 77.4 by 7.7mm. The iPhone XR is slightly lighter at 194g, but is thicker than both XS devices at 8.3mm. The iPhone XS is the lightest, weighing 177g. It is also the smallest, measuring 143.6 by 70.9 by 7.7mm. The iPhone XS and XS Max are made of recyclable stainless steel and each come in three colours: Gold, space grey and silver. The iPhone XR is made of recyclable low-carbon aluminium and comes in yellow, white, coral, black and blue, as well as a special (PRODUCT)RED edition. It should also be noted that the iPhone XR has a lower IP rating, giving it less water and dust protection as compared to its siblings. From a point-and-shoot perspective, users may not miss the extra camera lens much. The XR comes with a single 12-megapixel camera - similar to the one on the iPhone 6S - while the XS and XS Max have a double 12-megapixel camera with telephoto and wide-angle lens. However, a test shoot did not reveal any significant difference in quality between the shots. All three iPhone cameras have almost all the same features, from advanced bokeh and depth control - that was introduced in the XS - to Smart HDR. 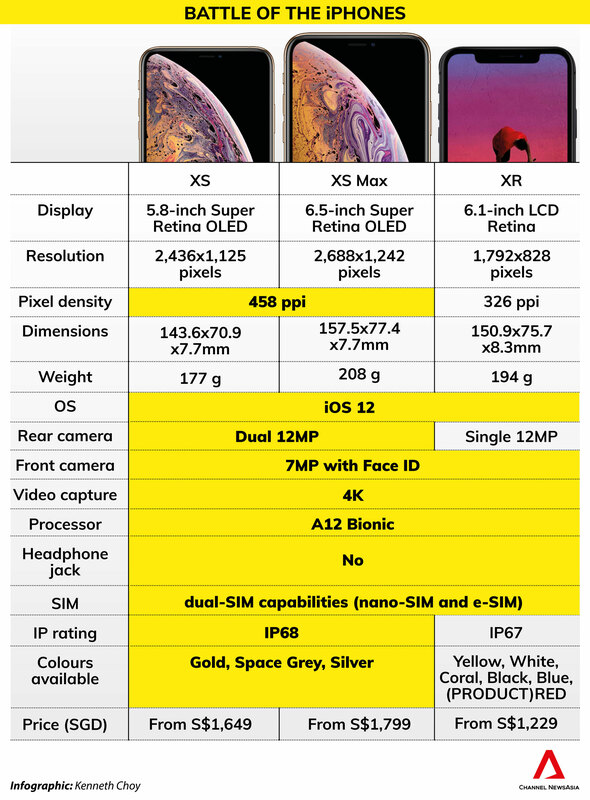 The most obvious difference is the optical zoom: The XS and XS Max's double lens camera has 2x optical zoom and a digital zoom of up to 10 times, while the XR only has a digital zoom of up to five times. The double lens of the XS and XS Max also allows for dual optical image stabilisation, unlike the XR with normal optimal image stabilisation. If lighting effects matter to you, bear in mind that the XR has only three: Natural, Studio and Contour. The XS and XS Max also has Stage and Stage Mono, in addition to those. And if you're a bokeh fan, the XR's Portrait mode is smart enough to tell whether you have a person in your photo - and if there isn't, you might have a hard time trying to trick it into applying bokeh. The XR may be the least expensive new iPhone, but it isn't the smallest - the XR in fact has a larger screen than its XS sibling. The XR has a display size of 6.1 inches, slightly larger than the 5.8-inch screen of the XS. However, the XS pulls ahead with its Super Retina OLED screen with a resolution of 2,436 by 1,125 pixels. It also has a pixel density of 458 ppi, the same as the XS Max and currently the highest on the Apple device market so far. On the other hand, the XR's LCD Retina display has a resolution of 1792 by 828 pixels. The XR also has a pixel density of 326 ppi - the same as that of the iPhone 4 and 5. What you need to decide though, is whether you really need the higher screen resolution of the XS - bearing in mind that higher pixel density can put a drag on performance and battery life. The XS Max is billed as the iPhone with the biggest battery ever - but is it also the longest-lasting? Apple's technical specs for the XS Max claim it has up to 25 hours' talk time, up to 13 hours' Internet use and up to 15 hours' video playback. Despite its smaller battery, the XR is touted to have a similar talk time but up to 15 hours' Internet use and up to 16 hours' playback - the longest battery life claimed for any Apple device yet. At S$1,229, the iPhone XR costs a little less than the XS, which retails from S$1,649 and the iPhone XS Max (S$1,799). If you're not fussed by the display or the camera, saving more than S$400 with the iPhone XR might be a viable idea if you just need to have that new Apple tech toy. But if you don't, it might be worth keeping in mind that at S$1,249 the Google Pixel 3 costs just S$20 more, and the entry-level version of the new Huawei Mate 20 retails from S$998.